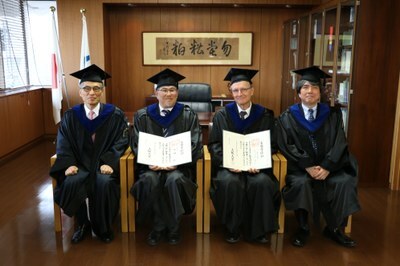 The two professors of the RWTH Aachen University, Dr. Jochen Büchs und Dr. Jun Okuda, received the honorary doctorate for their excellent achievements in research und teaching at the Osaka University in Japan. Jochen Büchs heads the chair of bioprocess engineering and is concerned with the characterization of shaken reactors and the development of online-measurement for small-scale culture systems. Dr. Jun Okuda, professor of organometallic chemistry at the institute of inorganic chemistry is concerned with the mechanism of catalyses that do not need any particular precious metals as well as the immobilization of these catalyses on modified proteins.